This week, we have 32 Contributions. Both Spanish and Serbian teams lead this week with 6 contributions each. 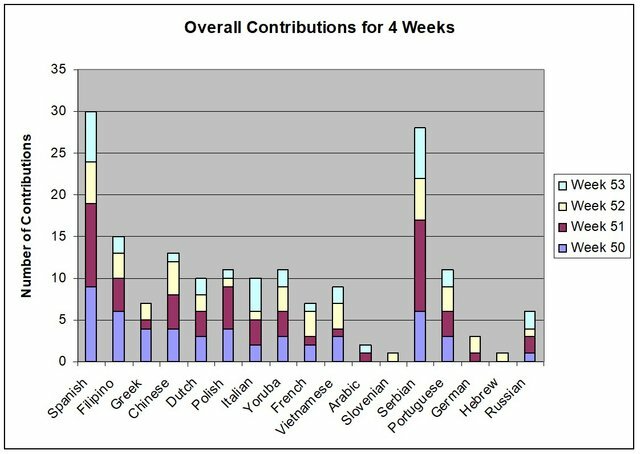 There are no contributions from Greek, Slovenian, German, Hebrew teams. 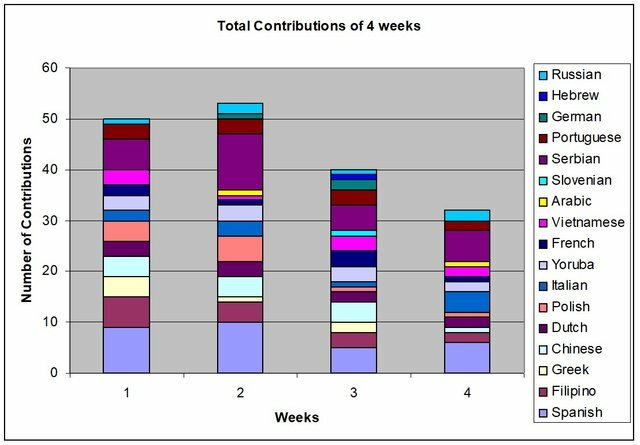 Here we will compare the total contributions in the translation category for 4 weeks time. 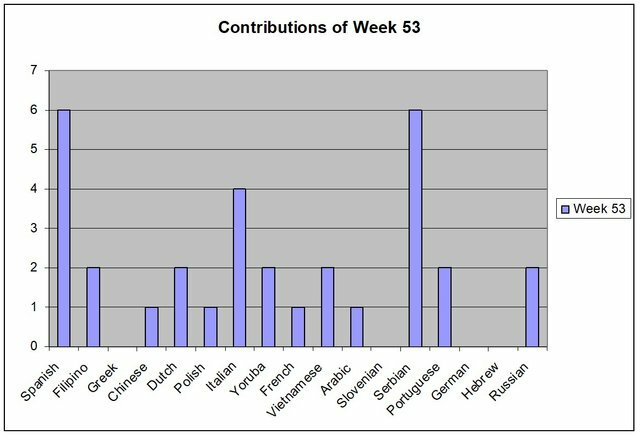 This week runs into the New Year holidays and this accounts for the fewer number of translation contributions this week. Next week should be get to normal. From here, we will need to find out what is happening to translators who are not active and reasons for inactivity. For the scoring distribution, we have 27 moderators, so I need to group the scoring into language teams so that you can see the analysis clearer in the distribution of scoring. 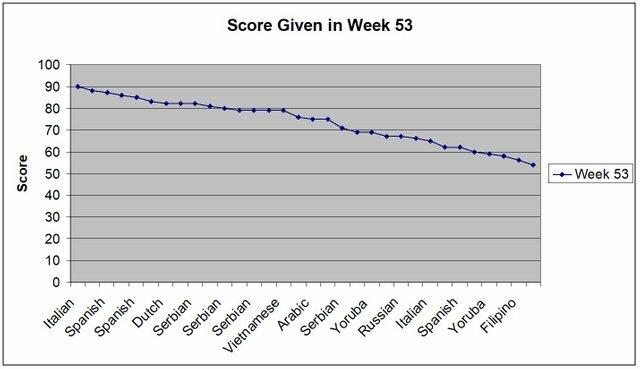 The X-axis is not able to list out all the languages for each score and only able to list out the language for every other 4 scores shown. The highest score this week is 90 given by the Italian moderator. The lowest score this week is 54 given by the Filipino moderator. About 40% of the contributions receive scores below 70. The scores of the new questionnaire is able to reflect the quality of the translation in a better spectrum. Contributions that are lower than 70 need remedial training. 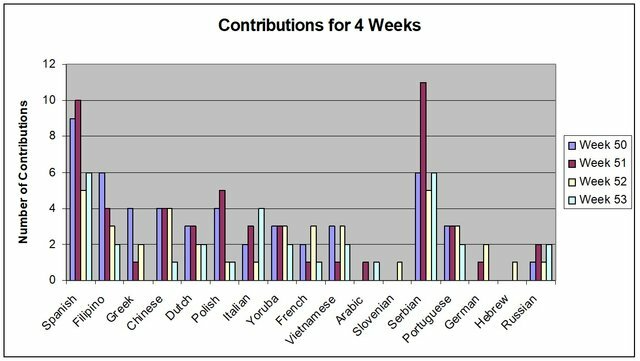 With 40% contributions receiving a score lower than 70, we need to upgrade the quality of our translators. 3. The average score of the Contributions is 73.5. In the old questionnaire, the average score was around 69. The new questionnair shows the average score a bit higher. 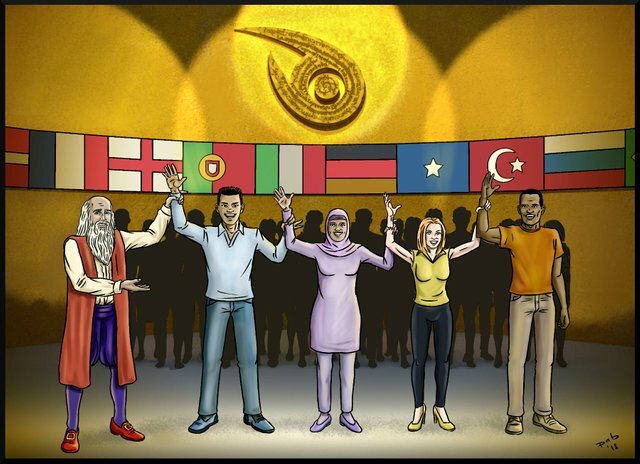 Since these translators have all been screened to do translation work, it is expected that they should score high to reflect the high standard of their work. The translator has done an excellent job in the translation free of error. In the post, @scienceangel wrote a most engaging post on the project progress. As noted by the moderator, she gave a lot of information on the 'Quirks and features' that can be found in the Serbian language and all Slavic languages. Super work! This is the most updated list of our Translations Members list. Although we have 104 members on the list, not all the translators are active. In the coming weeks, we will do some restructuring of the teams. Presently, all our LMs are active. We also see the need of having 2 LMs in every team in order to keep the teams working at their optimal level. Slowly we will add another LM to teams that have only 1 LM. As always, your report is nice, absolutely valuable. 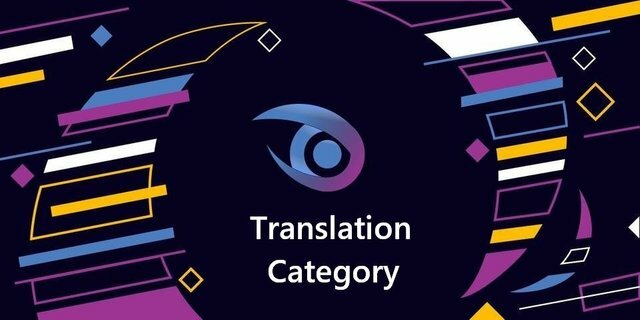 You shared all the information and activities of the Translations category. The charts are accurate, and the contents of the report are highly detailed. Your weekly overview is always among the most valued and the most superior for every week. I so much appreciate that. Great job! I understand that some of the information within the weekly report is always repeated. However, there are some issues that need to be fixed within your texts. I suggest you check properly before submitting your next report.